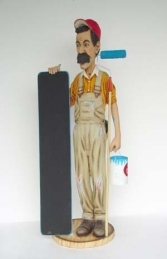 This life-size resin figure of a Carpenter holding a Menu black-board is a great model to use to promote any DIY building or carpentry business. Our popular Carpenter Figure holding a Menu black-board is a super model to use to attract customers to DIY and hardware shops ..he'd look great teamed with his Painter Decorator mate (JR 1886). The resin and fibre-glass Carpenter statue comes with all the tools he might need; he is holding a saw and has a tool belt with a hammer.